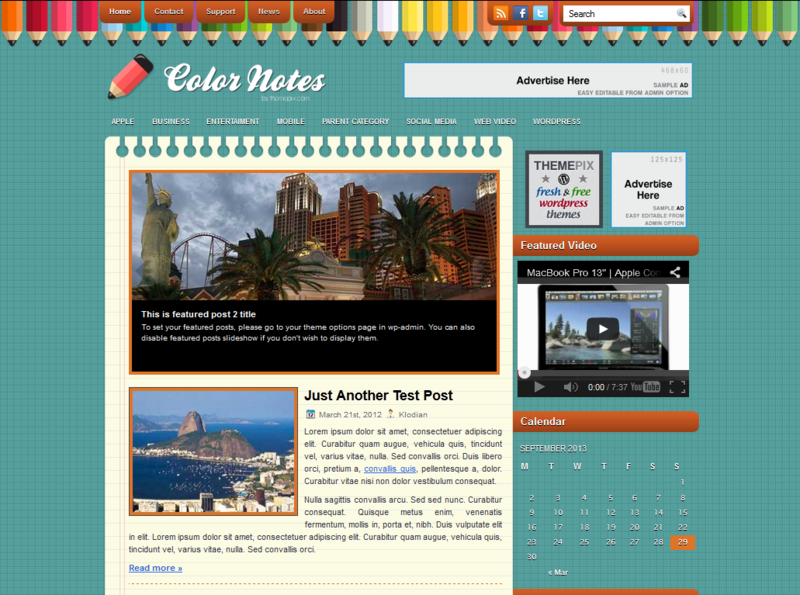 Color Notes is a 2 columns WordPress theme with Option/Admin Panel, featured posts and post thumbnail image. Suitable for personal blogs. All of these features are easy to enable via checkboxes on the theme options page. WordPress theme has widgetized areas which allow you to dynamically manipulate these areas in an easy to use drag-and-drop. Themes comes with a beautiful and highly customizable Slideshow to your Frontpage/Blog. It shows as many Featured Posts you decide. Recent activity on the Facebook and Twitter profile now will be shown on your WordPress theme sidebar. Social Icons is an easy to use, customizable way to display icons that link visitors to your various social profiles. Themes offers several places when you can place any kind of ad size, like 125x125px, 250x250px and 160x600px on sidebar. Displays the most popular posts with thumbnail on your blog sidebar based on post-views, no plugin required. WordPress theme comes with basic SEO optimization like homepage title, post titles, pages and navigation. Featured video allows you to add any YouTube video to sidebar. To do it is simple, just to go to theme option page. On theme folder you will find LOGO folder which has logo in PSD format. Create your logo in PNG and upload in your site. Latest WordPress themes can generate Sitemap which will help search engines like Google, Bing, Yahoo better index your blog. A Full Width Page is one that has no sidebars and all the width of the page is just content. You can create those easy.